Gift of Mr & Mrs C.W. Sahlman. I am grateful to Todd Smith, Executive Director of the Tampa Museum of Art, for clarifying which item in the collection is linked to Edoardo Almagià. The piece is an Apulian loutrophoros attributed to the White Sakkos painter acquired in 1987 from a private collector (inv. 1987.037). The private collector is reported to have purchased the pot from Almagià. 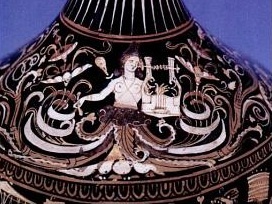 An Apulian loutrophoros features in an article by Michael Padgett ("A modern delight at the Tampa Museum of Art", Tampa Bay Magazine January / February 1991, 29-31 [p. 30]). It is recorded as the gift of Mr & Mrs C.W. Sahlman. Tampa also holds pieces from the Keros haul of Cycladic figures. They, too, are derived from the Sahlman family.